Developed by Hipster Whale, published by Bandai Namco. 1-4 players offline. Released June 21st, 2016 for Xbox One. This game is based off a famous bug in the original Pac-Man: when you got to level 256 of the maze, a glitch would occur that prevented further progress. 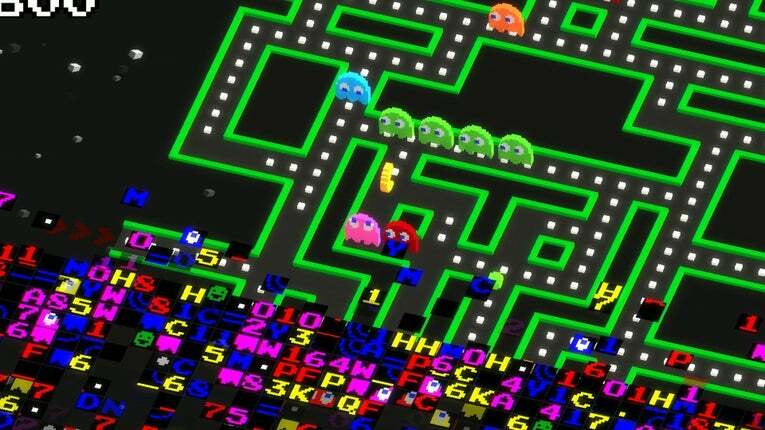 Now, in Pac-Man 256, you run an endless scrolling maze while the glitch chases you. There is a wide variety of power-ups but most of them are novelties of questionable usefulness. There are several types of ghosts, including groups that return from the Championship Edition DX games. If you're a big Pac-Man fan and have people to play couch co-op with you may enjoy this, but for most people I would recommend the 360's Pac-Man CE DX instead. I'm giving Pac-Man 256 a 6 out of 10 because even at $5 it is too expensive to have only 1 gameplay mode. The only things you can do besides running score attack endlessly are changing the visuals and spending earned credits on power-ups. I do like that you can set the graphics to "shuffle" so the visuals automagically change every time you play. The game is worth 1000G and most of the Achievements are quick & easy except 2--one will require you to eat 16 ghosts in a single power pellet run, which takes a little skill and a lot of luck, and the other requires you to fully level up every power-up which will take a LONG time. nice review! I liked the game. Someone has Pac Man fever! I love the 256 angle, but not the execution. Great review - but I am not a Pac Man fan. This will not be part of my backlog.